Boeing, Caterpillar and the U.S. Air Force don't always have the luxury of operating on even pavement and smooth concrete surfaces. That's why we created our new 7500 Series Casters. They blend premium forged steel casters with solid, heavy-duty pneumatic tires to haul Herculean loads across rugged terrain. The 7500 Series offers the same benefits as our pneumatic casters but with nearly twice the load capacity, puncture-proof tires and shock protection for heavy equipment. The new casters meet the growing demand from applications like aircraft ground support, aerospace manufacturers, construction and other outdoor uses. The series is available in six wheel sizes ranging from 10” to 21” diameters with load capacities from 1,000 to 4,200 pounds per caster. 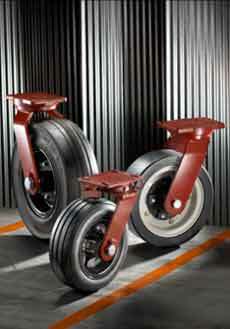 A dual-wheel version doubles its load capacity. Optional accessories including four position swivel locks and brakes are also available. Check out the full product specs, or call 1-800-733-7655 for more information. Way down in New Zealand, America's Cup contender, Team Oracle, hauls its giant catamarans from land to sea on Hamilton casters. 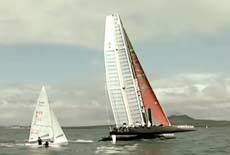 If you're a sailing fan you're sure to enjoy the boat racing action in the video. If you're a caster geek you're sure to note the Hamilton 16" pneumatic casters in the background of the various interview shots (first view 0:29-0:31 seconds and the best view 5:42-5:48). Spend Less Time with Customers. Increase Sales. If you're spending most of your time making presentations to customers, you're probably less productive than those who aren't. It's more about the hard work before and after than the actual meeting, according to a five-year analysis of data by SEC Solutions. Five years ago, top salespeople spent most of their time and resources in front of the customer, and average reps spent time planning and lining up resources. Now it's the opposite. Today's top salespeople spend 25% more time doing their homework by creating sales plans, researching prospects and harvesting customer feedback. With less time to present to customers, there's less margin for error. So this doesn't mean blow off the meeting. Instead, with solid planning, you could nab a prospect before you even walk through the door. 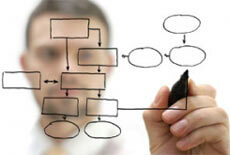 Do you spend more time planning or more time on the presentation? Drop us a note at info@hamiltoncaster.com. 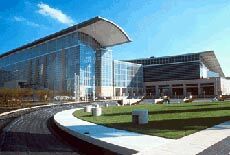 2662: That's our booth number at the ProMat 2011 show in Chicago from March 21-24. We're debuting our new Ultra-Max Duty caster at the show. This beast supports up to 40,000 pounds! 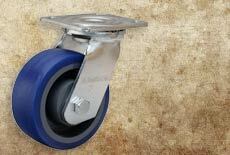 We're also featuring our complete line of industrial-duty casters, from 120 pounds to 23,000 pounds capacity. If you're attending the show, drop by and get the latest from Hamilton. Marty Wilson will be at the booth with Dave, Steve, Jim and Mark Lippert. Register here, and make sure to give our one-minute video your vote! See you in the Windy City. Clunky skids plagued our manufacturing floors for long enough. The cumbersome dollies, used to move about materials, were challenging to maneuver and constantly stuck to rubber floor mats. To remedy the problem, our engineers looked no further than our products themselves: rugged 52 Series casters with premium Poly-Soft® wheels. The new dollies have casters at all four corners, with swivel casters at one end to make them easier to turn. And with floor locks and Poly-Soft® wheels, the dollies move smoothly and don’t drift away. In this case, all it took was applying our own product to our factory workflow to end a lot of headaches and to continue toward our constant lean manufacturing goal. Since so much time was being wasted with inefficient clunkers, this change was long overdue. • Although they may look dangerous and confusing, roundabouts are safer than intersections for drivers because of low speeds. • The stats don't lie. Roundabouts have 40 percent fewer vehicle collisions than intersections. 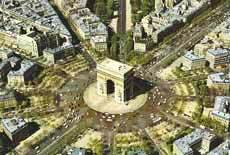 • Roundabouts are found all around the world, but more than half live in France (30,000 in 2008). • The first roundabout debuted in the United States in 1990, and now they're more common. • British engineers built the first roundabout in 1909 for pedestrians, but it wasn't until the 1960s that roundabouts became popular in Europe.